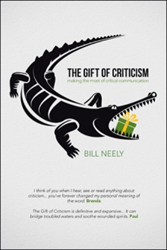 Hoping to influence the reader to consider criticism as a gift, Bill Neely presents it that way and shares how it can be beneficial in his new book, of “The Gift of Criticism: Making the Most of Critical Communication” (published by WestBow Press). “The Gift of Criticism” calls for a paradigm shift to change opinions about criticism. Neely talks about how it can be used as an aid to enhance relationships and promote harmony among people. He discusses specific concepts and skills that demonstrate how to present and respond to criticism so it can be mutually beneficial. Neely imparts stories and examples in order to illustrate how to incorporate the techniques and methods into daily life events and ease the stress of critical communication. “This book will aid those who seek, desire or need to improve relationships with themselves, at home, among family members, friends, school, co-workers, teachers, students, congregants and community members,” Neely says. Bill Neely is founder and president of Getting Along Better LLC, a relationship consulting business focused on enhancing relationships of all kinds in all settings. He and his wife, Edwina, will celebrate 48 years of marriage this year. They have four children - one of whom died in 2001. All the children are college grads. They have two grandsons. “The Gift of Criticism” is Neely’s first book. WestBow Press is a strategic supported self-publishing alliance between HarperCollins Christian Publishing and Author Solutions, LLC — the world leader in supported self-publishing. Titles published through WestBow Press are evaluated for sales potential and considered for publication through Thomas Nelson and Zondervan. For more information, visit westbowpress.com or call (866)-928-1240. For WestBow Press news, click “Like” at facebook.com/WestBowPress and follow @westbowpress on Twitter.